Climate change is a gradual process, driven by invisible pollution. So it can be hard to wrap your brain around. But atmospheric scientists at the University of Washington have made it possible to listen to the planet changing. You may never have heard of the Keeling Curve, though it touches the lives of everyone on earth. It traces how much carbon dioxide is in the sky. Scientists have been watching it curve upward since the 1950s, when Scripps geochemist Charles Keeling started his measurements atop Mauna Loa, high above Hawaii’s Big Island, in the middle of the Pacific Ocean. 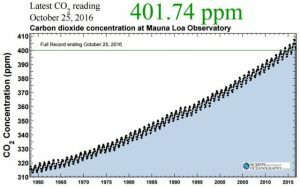 The Keeling Curve has become one of the most widely used indicators of humans’ impact on the planet. Graduate student Judy Twedt and professor Dargan Frierson converted half a century of data into about a minute of sound. Twedt assigned each monthly CO2 measurement a different pitch, spanning the same range as the notes on a piano. As plants breathe in CO2 each northern-hemisphere summer and breathe it out each winter, the musical pitch rises and falls. As smokestacks, tailpipes and deforestation add more CO2, the whole cycle keeps rising, taking the earth’s temperature along with it. Frierson, a scientist and a musician, added drums and made a music video out of the data. Climate scientists at UW have been trying some unscientific methods to get people to pay attention to the climate. They’ve made climate video games and even a film noir detective series about El Niño. Fifty climate scientists at UW, including Frierson, have stepped into the political arena by endorsing a carbon tax measure on the Washington ballot this fall. The carbon tax, which would be the nation’s first, has drawn opposition from the Association of Washington Business, with cement, aluminum and paper companies making the biggest donations to its $400,000 effort to stop Initiative 732. The measure has split the state’s environmental movement over whether it does enough to fight climate change and poverty. In addition to imposing a carbon tax, I-732 would lower the state’s sales tax (a tax that hits the poor harder than higher-income taxpayers) and offer tax rebates to low-income families and manufacturers. Unlike most measures on the Washington ballot this year, I-732 has had few large donors, and the grassroots activists with CarbonWA had little funding left after their campaign’s expensive signature-gathering phase. But 11th-hour fundraising in mid-October by Audubon Washington, one of the few large environmental groups to lend support to the measure, has brought in $740,000, with the largest donation of $250,000 coming from Texas billionaire couple John and Laura Arnold.